Home › Read Journals › 2018 – MY YEAR! Well it’s boxing day 2017, I’m at home with my children and my Mom and at the moment I am feeling very positive and determined to make 2018 a year of all good things for Myself, my Mom and my children. 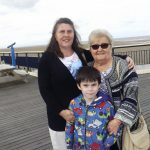 See since 2016 when I seperated from my little boys Dad, things have been very hard for me emotionally and financially, I’ve tried and over come a few times, then things have come to a head and its made it very difficult to move forward. 2017 saw me making decision based on me and my children, things that were good and somethings that were actually good for me, but not so much for my children. Or were good for the children and not so good for me. I had an epiphany. I needed life to be good for me and my 2 children. So decisions made it was down to just me and my babies (daughter is 14 years old and son is 7 years old) life would make good if we just did what we needed to do and be who we needed to be. Then my Mom had health issues, her arthritis was getting worse, she had eye sight issues, now she has goute in her knees. This is worse when it is warm, so knowing this I had to look after (I’m not an only child, my sister has her own life and has a 17yo son and twin girls ages 2yo – She and her partner work full time – she has no time for Mom) I love my Mom too bits and would do anything for her. This coming year, my aim is to get my Avon business up off the ground properly, do my weightloss through weight watchers, I’ve joined a gym to get myself motivated, give up smoking so I have more time with my kids and more money to spend on them. Here is to me being myself and being happier than I’ve ever been.. You never know maybe a decent man being in the mix too, one who respects me, my kids, my Mom and someone who my daughter and son will like. The latter doesn’t matter at the moment to be honest.. If it happens it happens. the main things are at the beginning.. Single Mom to 2 amazing children, carer to my Mom, worker at Tesco, Independant Avon Rep, Weight Watchers member and all round busy bee.. Doing my blog to give myself a place to let off steam so I don't let off steam at the most important people in my life! !